A rainwater irrigation system for gardens is a great way to conserve water while enjoying a beautiful garden. For those that live in areas with little measurable rainfall during the growing season, collecting rainwater is an easy and inexpensive way to help plants thrive without the salt and chlorine found in most municipal water systems. Conserving or harvesting rainwater is one way to water plants without the cost of pumping water from a well or public water system. Rainwater is healthier for your plants because it does not contain salt or chlorine. Both salt and chlorine will dehydrate your plants further. In arid climates, the use of municipal water may be limited during certain times of the year, usually when your garden is just getting off to a good start. 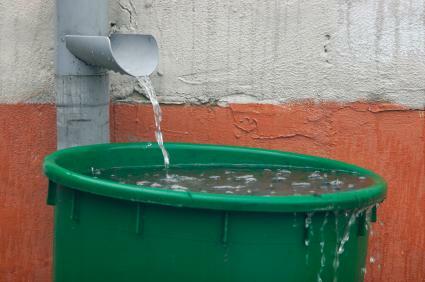 If you have stored rainwater, you'll be able to water your plants and keep them going strong. Rainwater also is good for the soil as it forces salt down from the surface of the soil past the plant's root system. Rainwater runoff- this is the amount of rainwater that falls on an impervious surface and can be collected for use right away, or stored and saved for later use. Plant water requirements- this refers to the number of plants that you have, their age, size and how close they are planted together. Using native plants in low water areas will help you sustain a garden in arid climates. Water collection and distribution system- this is the irrigation system that you design for use in your garden. Most gardens use a simple design that can be used to water plants immediately or stored in a barrel for future use. Catchment area- the catchment area is where the water is captured. For most gardeners this will be the roof of a building such as a house or other outbuilding. The best catchment areas are made of smooth metal or concrete. Distribution system- the distribution system refers to the design of the distribution of water to the designated areas. For example, you may use rain gutters and downspouts to direct the water to the garden or to a holding area such as a rain barrel. Landscape holding area- this is an area that has depressions in it to hold additional water during rainfalls or when stored water is released. This allows plants more time to absorb the water instead of the water running off before plants can absorb it. Depressed areas can be dug out with a shovel with the left over soil being used to shore up other areas to retain water. A simple rainwater irrigation system for gardens can be made up of your roof (the catchment area), a gutter and downspout (the distribution system) and a rain barrel (landscape holding area). Many people with this type of system will then run a hose from a spigot in the barrel to their garden, or simply carry water in watering cans from their barrel to the garden. The total cost of this type of system will be under $100- the cost of the rain barrel and a hose. A simple rainwater irrigation system for gardens can be constructed in a weekend, especially if you are just adding the rain barrel to your existing gutter and downspout from a building. Creating simple catchment areas around your garden usually doesn't take much time either and the results are usually immediate. Consider using a rainwater irrigation system this year in your garden; you'll reap the benefits during the next drought.